As children learn to speak, they listen and try to imitate the speech of those around them. They are developing the muscle control and fine, rapid movements needed for clear speech. Sometimes this process does not go smoothly. One typical snag in a child’s development of clear speech is difficulty with phonological processes. 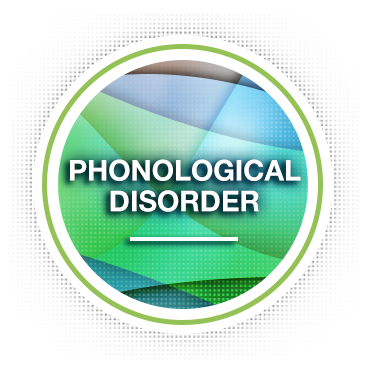 A phonological process is a sound pattern, and a phonological disorder is speech difficulty due to a consistent pattern of errors. Children with phonological disorders will substitute, leave off, or change sounds. Younger children often do this when learning to talk – it becomes a disorder when it persists past a certain age. By the age of 8, most children are able to produce all sounds in their native language correctly. By the age of 3, about half of what they say should be easily understood by a stranger, and by the age of 5, most of what a child says should be intelligible. If at any age your child is having speech problems that are worrying or embarrassing him, it’s best to get help from a speech-language pathologist. It’s often hard to know what causes a phonological disorder. They are more common in boys than in girls. A child may not learn how to produce sounds correctly or may not learn the internal rules of speech sounds on his own. Children do not always outgrow speech development problems by themselves. Most children do develop all necessary speech sounds eventually, but others need help from a speech-language pathologist to learn correct speech sounds. Physical problems are at the root of some speech sound errors. These include developmental, genetic, and neurological difficulties. Children who had a lot of ear infections when they were young and lost hearing as a result are at risk for speech sound disorders. Sometimes a child’s relatives also had speech difficulties. Most often, though, parents never know why one of their children has particular difficulty developing clear speech. What can I do to help my child with a phonological disorder? A speech-language pathologist can help your child by demonstrating how to produce various speech sounds correctly, teaching your child to recognize which sounds are correct and incorrect, and having him practice the sounds in different words. The therapist may help the child create a sound, for example by showing where to place the tongue or how to form the lips when making the sound. Because the nature of the error affects a whole family of sounds, often once the child learns the correct process he is able to produce a whole group of sounds clearly.